After cooling, if the wood pellets are not immediately used for fuel, the pellets must be packed to avoid absorbing moisture from the environment. 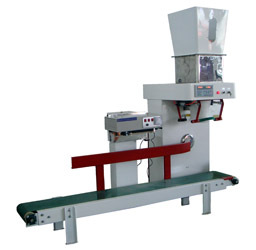 For this process, KMEC provides the Semi-Auto Pellet Bagging Machine. Most clients require one small scale auto-sealing pellet bagging machine, as well as one large-scale semi-auto pellet bagging machine. The weight range can be decided by clients. This is an automatic bagging machine. It is composed of a quantitative packing electronic scale, a hemming machine and a conveyor heat-sealing machine. The quantitative packing electronic scale includes feeding part, filling part, and weight control meter systems.. This DCZ Automatic Bagging Scale belt feeder type with single weighing hopper provides a complete bagging and packing arrangement, available in a range of sizes, handling 5 - 25 kg bags at up to 500 bags per hour. High accuracy with weighing precision: static + 0.1%, dynamic + 0.2%. 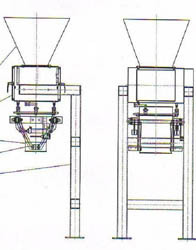 The system comes complete with a feeder, hopper, scale, sewing machine and bag conveyor. Bag weights are adjustable and can be preset. In continuous operation, the weights of individual fill and cumulative fill are recorded and shown on the digital display. This semi-automatic scale needs the bag to be placed under the machine by hand, but material filling, weighing, and transporting are all automatic. High accuracy with weighing precision: static + 0.1%, dynamic + 0.2%. It can be modified to automatically transfer packed material from packing place to storage place. Henan Kingman M&E Complete Plant Co., Ltd is one of the leading Chinese companies specialized in the design and manufacture of wood granulator and pellet bagging machines.